Skin temperature monitoring with IR19 or IR 21 B reduces the risk for diabetic foot ulceration, healthcare costs and could save more toes, feet and legs! 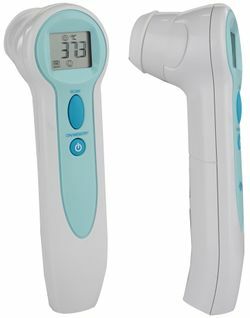 Use new IR19 or IR 21 BT skin thermometer as a screening tool to identify inflamed areas of skin. Measure the skin temperature at six sites on each foot daily. If any site had an increase in temperature of >2.2°C compared with the corresponding site on the other foot immediately take care about the foot with higher temperature. Meets the accuracy requirement specified in ASTM E1965-98 and the EC directive 93/42/EEC.